At Creekside we pride ourselves in offering English Labrador Retrievers of superior temperament, health, and conformation to homes across the U.S.A. You will find that our warm, caring, family-style approach combined with seventeen years of professional English Labrador breeding experience result in excellence whether you are searching for a puppy for show, field or couch. Our English lab puppies enjoy the good life - surrounded by the best of God's creation and nurtured by a loving family. Our labradors revel in it and we hope that you will to!o. You will also want to see what others are saying about us in the References page. Our litters comes from English champion lines, have OFA hip/elbow certifications, CERFed eyes for several generations. All of our puppies are carefully bred in a family environment for temperament, conformation and health. A comprehensive two year health guarantee, Puppy Aptitude Testing, vaccinations and dewormings, microchip, ongoing breeder support and AKC limited registration are included. 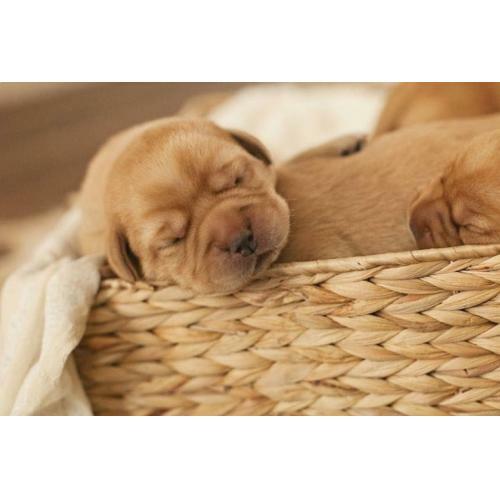 For the 25th consecutive year, the Labrador Retriever is the most popular purebred dog in America, according to registration figures released by the American Kennel Club (AKC). As a breeder, these statistics make me aware of my responsibility to provide the healthy, loving, beautiful labradors America is looking for. If responsible breeders don't take this responsibility seriously, future dog owners will search for their puppies in all the wrong places - most likely in pet stores that acquire their "stock" from inhumane puppy mills or in the yards of breeders who are solely interested in a profit having little knowledge or desire to better the breed. T.L.C. is Creekside's innovative concept that allows for us to to produce superior quality puppies without compromising on care and socialization. We currently have dams and sires and puppies that live with friends whom we call our T.L.C. families. These families chose to adopt dogs of superior health, temperament, and conformation and partner with us in our breeding program. Our T.L.C. owners are people that we know and trust who treat our Creekside lab as a valued part of their family. They own the best picks of the litter and provide a nurturing environment for our dogs along with excellent nutrition and veterinarian care. If the females meet our breeding criteria, they are bred and come back to Creekside for the whelping and nurturing of the litter. Creekside gives each dam and puppy the very best in reproductive knowledge and care. The litters are well socialized with our children and after each pup has gone to his/her new home, the females return to their T.L.C. families. In addition, because females are living apart from each other, the timing of their heat cycles is spread out meaning that our litters aren't being whelped simultaneously. Our males are used as studs as the need arises. We are proud of our T.L.C. approach. The partnering between Creekside and loving families gives each Creekside lab the very best - no kennels, no runs, no overcrowding. We have found it an ideal way to combine expert breeding with the heart of a loving home. We hope that you will find it obvious that we are passionate about what we do. You are invited to enter our world.